What hotels are part of Maldron Hotels and Partners? Find a list of our hotels here. If you click on the hotel name it will bring you directly to the hotel website. How do I cancel or amend my reservation? Click here to manage your booking online or call our central reservations offices on either 1850 885 885 (Republic of Ireland) or +353 57 869 5946 (UK & worldwide). Where are your hotels located? Please visit our Locations page to see where our hotels are located. How do I check for availability in Maldron Hotels and Partners? The Make a reservation booking widget is on all of the pages on our website where you can choose a hotel and book directly. Do Maldron Hotels and Partners have leisure centres or fitness facilities? Yes, many of our hotels are fully equipped with leisure facilities. For more information please visit our Leisure Club section. Do your hotels have parking facilities? Many of our hotels have car parking facilities, some have complimentary car parking. Please visit the individual hotel website to see what they offer. What is the phone number for central reservations? Central Reservations can assist you with all your queries and recommend the best hotel to suit your needs. 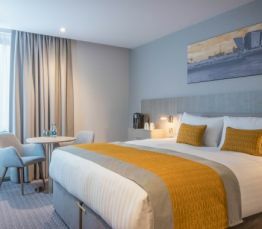 Take advantage of 20% off Room Only and stay at the Newly built Maldron Hotel South Mall Cork City. Sign up to Make it Maldron to receive a further reduction of €10 per night off your stay. Most centrally located Hotel in Cork City, located on South Mall & Oliver Plunkett street. Our Cancelation Policy is as follows: By 2.00pm (local hotel time) 24 Hours prior to the day of arrival. In the event of a no-show or cancelation, the hotel will charge the first night rate to the credit card used to guarentee your reservation.